What is a Telephone Card? A telephone card is most commonly a credit card size piece of plastic containing pre-paid credit that enables the bearer to make telephone calls from a public or private payphone that accepts telephone cards. 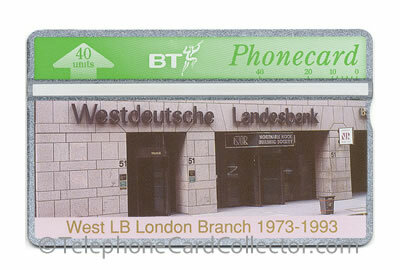 Pictured above - BT Phonecard issued by the Westdeutsche Landesbank. During a telephone call using a phone card units or the cards credit is consumed by the cardphone. Once all remaining credit has been used, the card cannot be used to make phone calls again. A new telephone card is then required to make subsequent or a continuation of the phone call. 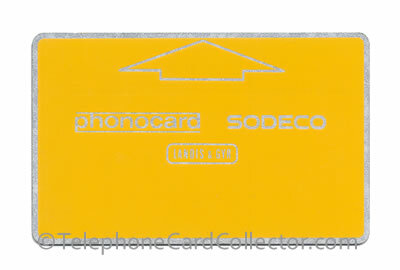 The used phonecard can then be discarded in a bin or becomes a collectors item and forms part of a collection. Read more about collecting telephone cards. Did you know? A collector of telephone cards is known as a fusilatelist. Although all telephone cards serve the same purpose, over the years there have been four distinct technologies used in Phonecards from around the world. Magnetic cards - the very first phone cards which were issue in Italy in 1976 used a magnetic strip to encode the cards credit. Optical cards - the following year Swiss telephone card manufacturer Landis & Gyr (L&G) starting producing optical cards. Chip cards - a decade later in the mid eighties and with advances in technology, phone cards using a embedded micro chip, known as "chip cards" were introduced. Many of these chip cards were pre-programmed to expiry after a specific date, meaning the card had to be used before the date indicated. British Telecom (BT) introduced chip cards in 1996 when they replaced the ageing L&G optical cards. Remote cards - another advance in technology and phonecard users could simply dial a telephone number from almost any phone to make a phone call. The user would simply need to scratch off a panel to reveal a unique code found on the reverse side of the phonecard. Many of these telephone cards on the other side contained a chip, giving the user ultimate choice where they could use their phonecard. 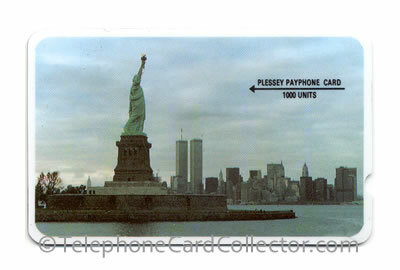 Pictured above - Plessey payphone card pictures New York's skyline including the Statue of Liberty and Twin Trades Towers. While telephone card technology may have mainly come out of Europe, phonecard usage spread to almost ever corner of the globe, including North America, Australasia and Russia. Different countries from around the world used different card technology and the names that countries or their telecommunication companies gave to their phonecards differed as well. But the premise of what a telephone card achieved is the same the world over. Found a foreign phonecard and want to know the value of the telephone card in your home currency? Use the currency converter at www.exchange-rates.com to make the currency conversion using live exchange rates. Many of the worlds phonecards have been listed in various telephone card catalogues. The UK's latest phonecard catalogues can be purchased online via this website. Do you know of more countries? Do you know of any countries not to use telephone card? Please contact me and let me know, so I can update and add to the information on this web page. Pictured above - Early 1980's Landis & Gyr Phonocard Sodeco card - this card could only be used in the Swiss Parliamentary Building in Bern, Switzerland.